Slow Internet connection adversely affects ease of doing business and hampers the advancement of telecommunication services and facilities in all areas of the country. This was emphasized by Senator Bam Aquino as he formally filed a resolution calling on the Committee on Trade, Commerce and Entrepreneurship, which he chairs, to investigate the slow and costly Internet service in the country. 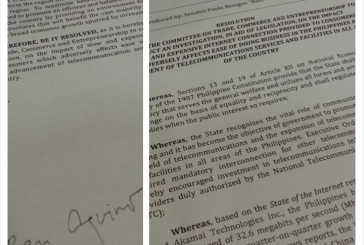 In his resolution, Aquino reiterated the need to ensure that all users of Internet services shall have access to it anytime and anywhere in the country at an acceptable standard of service and at a reasonable cost. Aquino made the move after it was reported that the Philippines is at the bottom of the list of ASEAN countries (3.6 Mbps) in terms of Internet speed, way below the ASEAN average of 12.4 Mbps. A report by the Massachusetts-based Akamai Technologies Inc. entitled State of the Internet mentioned that the Philippines’ low use of broadband technology as well as high costs for internet users compared to other countries mean slow average connection speeds for consumers. 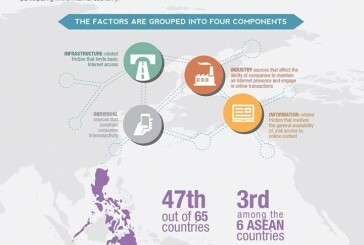 A study commissioned by the Internet Corporation for Assigned Names and Numbers (ICANN) and released by Boston Consulting Group (BGC), saying the Philippines is trailing its ASEAN neighbors in terms of Internet infrastructure. The study also mentioned that the Philippines has the eighth most-expensive fixed broadband pricing among 65 countries included in the study. Also, Aquino took notice of the expensive Internet service in the country where Filipino consumers spend around One Thousand Pesos (Php 1,000.00) per month for speed up to two (2) Mbps and around Two Thousand Pesos (Php 2,000.00) for speed up to five (5) Mbps. “Comparing the prices of Internet services among Southeast Asian countries, the cost to Filipino consumers is way more expensive than the Internet costs in Singapore and Thailand, which have the fastest connections globally,” said Aquino. The senator said improving Internet connection in the Philippines is crucial to the ASEAN Economic Integration, which aims to transform the region into a single market and production base, and a highly competitive region. “We should provide an environment for the emergence of communications structures that will benefit the vast majority of consumers in the country which has a broad economic growth geared towards increasing competition,” Aquino stressed. Senator Bam Aquino vows to work against practice of companies to hire employees based on age, calling it discriminatory on the part of workers above 45 years old who still want to be productive citizens. “This practice is unacceptable because we want to encourage our citizens, including those in advanced years, to be productive. Kung kaya pa naman, bakit natin hahadlangan ang pagnanais nilang magtrabaho,” said Aquino, chairman of the Senate Committee on Trade, Commerce and Entrepreneurship. “If we prevent them from exercising this right, then it is tantamount to discrimination, which has no place and should be outlawed in today’s society,” stressed Aquino. 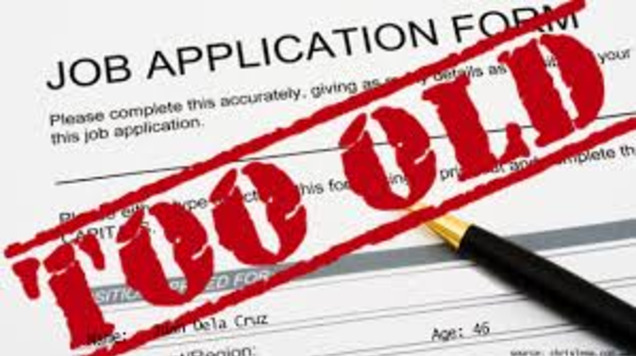 Aquino made the pronouncement after receiving complaints from several jobseekers about this practice of companies to turn down applicants who are above their maximum age requirement of 45. The senator said companies should give seasoned workers a chance to earn their livelihood, as long as they can perform the required duties and responsibilities required. “Kahit ano pa ang edad, basta kaya pang magtrabaho dapat bigyan ng pagkakataon para kumita,” he said. Aquino said he would work for the removal of age requirement by companies looking for workers. “From I understand, there is already an existing bill about age discrimination. I will work for it to be incorporated in the anti-discrimination bill that I recently filed,” Aquino said, referring to his Senate Bill 2122 or the Anti-Discrimination Act of 2014, which seeks to combat discrimination of any form. Recently, Aquino received a letter from a 55-year-old former overseas Filipino worker who still wants to work to help his family. In his letter, he called on Aquino to work for the passage of a bill that will remove the maximum age limit of 45 imposed by companies on applicants. At the same time, Aquino called on companies to base their criteria for applicants on skills and not on degree. “As they say, experience is the best teacher. Many important things are not being taught in schools and they are learned on the job. Some of the best people I know don’t have college degree but they excel in their respective fields,” Aquino added. This way, Aquino said companies would help address the problem of job mismatch hounding the labor industry. Better shape up or be left behind. Senator Bam Aquino urged the government, local telecommunications industry and other stakeholders to find ways to quickly improve the country’s Internet systems, with the 2015 ASEAN Economic Integration fast approaching. “With its slow and expensive Internet connection, the country may be left behind in the battle for the information and communications technology (ICT) market,” said Aquino, chairman of the Committee on Trade, Commerce and Entrepreneurship. “We should step up and shape up or we will be eating dust from the competition,” added Aquino, who recently called for an investigation regarding the country’s slow and expensive Internet connection. The lawmaker said the ASEAN is pushing for the strengthening of the ICT industry as it is seen as one of the drivers in the economic and social transformation of the region. According to the ASEAN ICT Master Plan, Aquino said one of the main goals is to create conducive business environment to promote trade, investment and entrepreneurship in the ICT sector. However, the senator expressed apprehension over the country’s capacity to compete with neighboring countries with far more advanced technology in terms of Internet connection. “One of the foundations of a good ICT industry is a reliable and fast Internet service. If we don’t have that, the country’s chances to grab a lion’s share of the market is lessened,” Aquino stressed. Aquino cited a study commissioned by the Internet Corporation for Assigned Names and Numbers (ICANN) and released by Boston Consulting Group (BGC), saying the Philippines is trailing its ASEAN neighbors in terms of Internet infrastructure. The Philippines garnered an overall e-Friction score of 64, third among the six ASEAN member-countries covered by the report, behind Singapore (15th overall) and Malaysia (28th). Thailand was one spot lower than the Philippines at 48th, Indonesia was 59th and Vietnam, 61st. However, the Philippines was 53rd in terms of infrastructure friction component, composed of fixed- and mobile-broadband connections, bandwidth speeds, and pricing, among other things. Also, the study showed the Philippines has the eighth most-expensive fixed broadband pricing among 65 countries included in the study. “I called for an investigation to find solutions that will fix the situation and eventually, provide better service to consumers and improve the country’s business climate,” Aquino said. Senator Bam Aquino calls for an investigation to determine if consumers are indeed getting their money’s worth from Internet service being provided by telecommunication companies. The senator made the move after it was reported that the Philippines is lagging behind its Southeast Asian neighbors in terms of Internet speed. According to ASEAN DNA, the Philippines (3.6 megabytes per second) lags behind Laos (4.0 Mbps), Indonesia (4.1 Mbps), Myanmar and Brunei (4.9 Mbps), Malaysia (5.5 Mbps) and Cambodia (5.7 Mbps). Other countries mentioned in the report include Vietnam (13.1) and Thailand (17.7), the only two other Southeast Asian countries joining Singapore (61.0) as those above the ASEAN average of 12.4 MBPS. The senator wants to determine why some neighboring countries in Southeast Asia enjoy faster Internet speed at a much cheaper price while the Philippines bear the brunt of slow connection. “There are constant complaints about the provider’s failure to deliver on its promised connection speed, which usually leads to slow Internet link,” the senator said. On the average, consumers shell out around P1,000 a month for Internet service with speeds of up to two megabytes per second (MBPS) while some telecommunication companies offering speed of up to five MBPS for around P2,000 a month. “This is expensive compared to Singapore and Thailand where we can find some of the fastest Internet connections in the world,” Aquino said. Singtel, the largest telecommunications company in Singapore, offers 15 megabytes per second of Internet speed for 36.90 Singapore dollars or around P1,312 a month (P87 per MPBS). Thailand’s True Internet, for its part, provides 12 MBPS of connection for about 799 baht or P1,100 (P92 per MPBS). “Do we always have to pay a steep price for slow and sometimes unreliable Internet connection? NTC should provide a logical and clear explanation on this,” Aquino emphasized. The senator added that the investigation should look into ways on how to improve the country’s poor Internet connection, which is crucial to the country’s economic growth. “We have to find ways to improve the system and fast, especially with the ASEAN Economic Integration happening a year from now,” Aquino said. Senator Bam Aquino has called on the Department of Trade and Industry (DTI) to intensify monitoring on cost of construction materials in Eastern Visayas after receiving reports of overpricing in areas devastated by Typhoon Yolanda. “The DTI should double its monitoring efforts because some unscrupulous businessmen are taking advantage of the situation in Tacloban and nearby areas,” said Aquino, chairman of the Senate Committee on Trade, Commerce and Entrepreneurship. “We should punish these merciless traders for preying on our countrymen who have already suffered much because of the typhoon,” he added. Aquino said traders should not use supply as issue with routes already passable and shipping operations now back to normal. “The super typhoon happened four months ago. Delivery delays cannot be used as reason since all the routes going to Tacloban and other areas have opened,” Aquino said. Aquino received reports from concerned citizens in Tacloban and nearby areas that some hardware stores sell ¼-inch plywood between P370 to P400, from its previous price of P290 to P300. “From its old price of P550 per cubic meter, sand is being sold at P800 per cubic meter while gravel is now at P1,350 per cubic meter, P400 higher than its previous cost,” the senator said. Aquino also revealed that price of hollow blocks doubled from P9 to P18 while ply board is now P965, from P845 to P900. The senator said Portland cement, which usually costs around P222, now sells at P235, tie wire at P1,475 from P1,190 and 10-millimeter steel bar at P130 from P123. “Even those hardware stores from nearby areas which were not affected by the typhoon also sell overpriced construction materials,” Aquino said. The senator added that Tacloban residents opt to travel more than 100 kilometers to Ormoc City where construction materials are cheaper. Around twenty five percent of imported and locally manufactured steel products sold in the country are either mislabeled or substandard. This was revealed by industry stakeholders during the hearing of the Senate Committee on Trade, Commerce and Entrepreneurship chaired by Senator Bam Aquino. “One study came out and this was relayed to me by the Philippine Steelmakers Association (PSA) that up to 25 percent of all steel in the market is actually mislabeled or substandard,” Aquino said during the hearing. Aquino called this scenario unacceptable, saying this comprises a form of corruption and fraud as the public pays good money for right quality but end up buying substandard materials. “Initially, these substandard materials probably won’t make a difference but when disasters strike then it becomes really important,” the senator added. Also, the Philippine Iron and Steel Institute (PISI) disclosed that about 450,000 metric tons out of two million metric tons of imported steel were substandard or smuggled. The PISI said these substandard steel products made its way to the country through misdeclaration or direct smuggling. “How can anyone miss 18,000 container vans with 450,000 metric tons of imported steel,” Aquino asked during the hearing. Among the substandard imported steel products were 300,000 metric tons of wire rods that were converted to reinforcing bars or rebars and used for the construction of 60,000 homes in different parts of the country, putting 300,000 lives in danger. With this, Aquino has called for a systemic reform within the Bureau of Customs through the passage of a Customs Modernization law to make it more efficient against smuggling. “If we have a more computerized system, malinaw na malinaw kung anong binabayad na taripa, that could stop smuggling in the long run,” Aquino stressed. “You have countries like Singapore, what takes them half a day takes us weeks to do. Di talaga acceptable na sa modernong panahon, napaka-Jurassic ng ating sistema sa Customs,” he added. At the same time, Aquino lauded Customs Commissioner John Sevilla for coordinating with the DTI and the Bureau of Internal Revenue to strengthen the agency’s fight against smuggling. “I’m happy to say that Customs Commissioner Sevilla is pushing for a major overhaul ng kanilang sistema. Hindi na sapat kasi na individual lang ang ginagalaw-galaw o nililipat-lipat,” Aquino said. A bright future awaits Mindanao youth with the Comprehensive Agreement on the Bangsamoro (CAB) expected to provide them more educational and employment opportunities. “The CAB signing will open more opportunities to the Mindanao youth that will help them chart their future, especially in terms of education and employment,” said Senator Bam Aquino, chairman of the Senate Committee on Youth. In the past, Aquino said thousands of students were restrained from going to school because of armed conflicts in different parts of the region. “Many of these students were forced to stay in evacuation centers far from conflict areas, depriving them a chance to finish their studies and become productive citizens,” he added. Aquino said students could expect continuous education because the new agreement is focused on achieving long-term peace and order in the region. “Students now have the chance to acquire the knowledge they need to have a brighter future without worrying about their safety,” Aquino stressed. Aquino added that more employment opportunities await youth workers with the expected influx of businesses and investments in the region. As of 2012, the senator said 300,000 of the country’s more than 1.4 million unemployed youth are in Mindanao. “With new businesses and investments expected to put up shop in Mindanao, our young workers will have the chance to put their skills and knowledge to good use,” Aquino said. Also, Aquino said his “Go Negosyo Act” could help young workers become entrepreneurs through the establishment of their own small business. The Act, which was passed on third reading by the Senate, calls for creation of Negosyo Centers, under the Department of Trade and Industry (DTI), in each city and municipality around the country. Aquino said these Negosyo centers are designed to make it easier for entrepreneurs to register and start up their businesses, as well as gain access to sources of financing. The Negosyo Centers will also provide courses and development programs, training, give advice on business conceptualization and feasibility, financing, management, capability building, human resources, marketing and other support services. With the signing of the Comprehensive Agreement on the Bangsamoro (CAB), Senator Bam Aquino expects Mindanao to become a magnet for businesses and investments that will boost its long-awaited economic development. “Now that the CAB is signed, sealed and delivered, Mindanao will be an attractive destination for businessmen who will provide jobs and other livelihood in the region,” said Aquino, Chairman of the Senate Committee on Trade, Commerce and Entrepreneurship. “With peace and security now at hand, the region’s journey from decades of infamy to prosperity and economic growth now begins,” the senator said. The senator believes that the expected economic development will help uplift the lives of our brothers and sisters in the region, especially those living in war-torn areas. “The arrival of businesses and other investments in the area will give them a chance to revive lost opportunities and due to the conflict,” Aquino noted. Aquino added that the government’s quest for inclusive growth would be achieved, with Mindanao on its way to economic development. At the same time, Aquino emphasized the importance of his “Go Negosyo Act” in helping Mindanao in development, saying it will open opportunities for small businessmen and entrepreneurs in the region. Aquino said these Negosyo centers are designed to make it easier for entrepreneurs to register and start their own businesses, as well as gain access to sources of financing.